I’m glad the hot weather has arrived…and I mean hot. Lunchtime again, what’s on the menu today? Although, I cook a hot lunch for my working man,usually pasta or rice with varying homemade sauces. I’m still use to having my salads or sandwiches. Today I thought I’d try this recipe. And I’m glad I did. It’s light, different and with added vitamins in disguise. 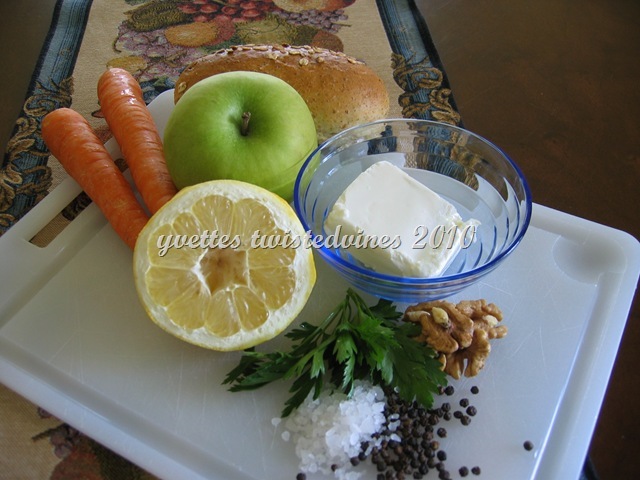 I used cream cheese, because that’s what I had available, but I think this would work well with any soft cheese.Cut the walnuts and parsley finely,add the cream cheese and 1 tablespoon of lemon juice. Salt and pepper to taste. With a peeler, slice long strips of carrot,(6)and grate finely the rest of the carrot.I used half an apple, wash,peel and grate finely. Add grated carrot and apple to the cream cheese mixture. Add another tablespoon of lemon juice,and mix well. 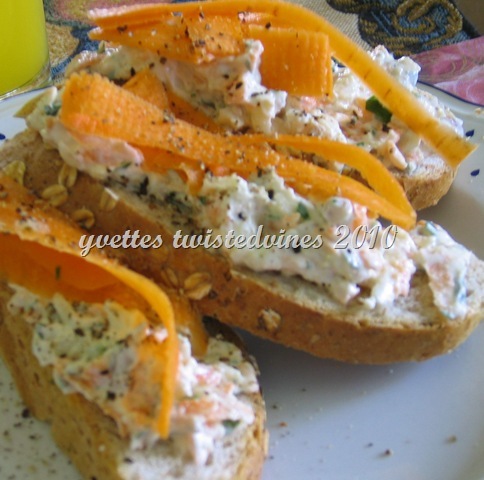 Slice the bread roll into medium slices, place the mixture on top, garnish with the carrot strips. Lunch my friends is ready. Healthy, light, and delicious! Your lunches look really good, and packed with vitamins! 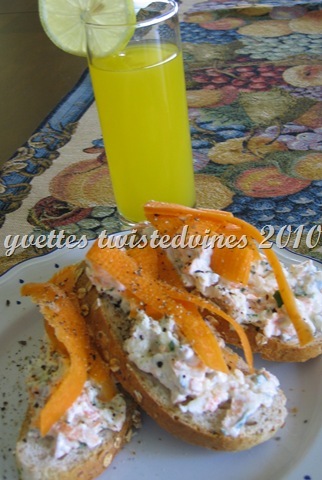 I look forward to visiting your blog often, to see more great recipes! These look tasty. Enjoy that lovely Italian summer…mmm, a chilled glass of your delicious prosecco perhaps with your open sandwich?